Whether they’re heirlooms or treasures you’ve found at auction, antique metal pieces have a special beauty that can lend distinction to your décor. Preserving the beauty and value of silver or bronze requires knowing what state the metal should be in and how best to clean and maintain it. Both neglect and improper cleaning can damage antique metals, so it’s important to educate yourself before you make an irreversible mistake with a prized object. Silver is known for its bright finish, but anyone who owns silver flatware or display pieces knows that finish can be quickly dulled by tarnish. As counterintuitive as it might seem, tarnish is not harmful to silver. However, harsh cleaning methods can be. 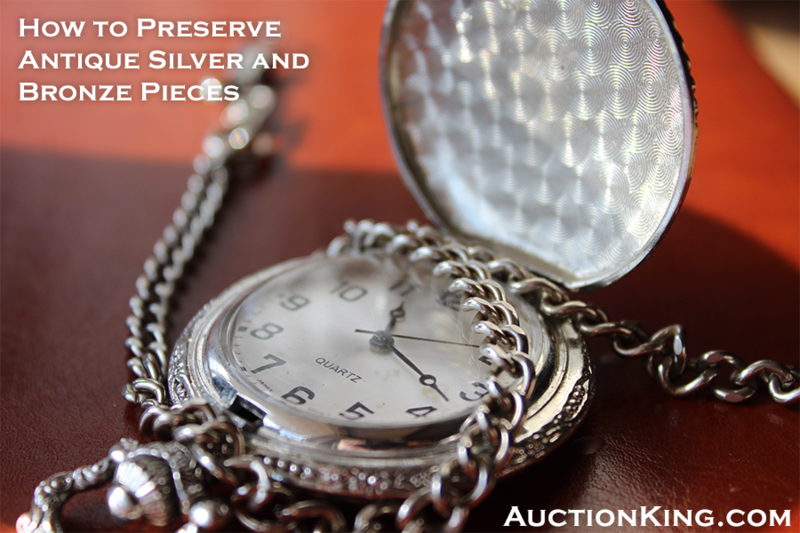 Silver is vulnerable to scratching and denting, so your antique items should be handled with care. Also, polishing silver actually removes a small amount of silver every time you do it, so you want to do it as infrequently as possible. Prevention is key to minimizing the amount of tarnish that develops on your silver. If you are storing your silver, you need to avoid areas of high humidity and high heat, both of which make silver tarnish more rapidly. When you put it away, you should wrap it in acid-free tissue paper or undyed cotton or linen cloth, which will help prevent scratching and reduce tarnishing. You can also purchase special cloth or bags that are treated with silver nitrate or other chemicals that slow down tarnishing. Storing silver in plastic bags is not recommended, because while it might keep out the sulfur that causes tarnish, it can also trap damaging moisture. If you’re keeping your silver out on display, you can slow the development of tarnish by putting camphor blocks or special anti-tarnish cloth or paper in the display cabinet with your items. When your items do need cleaning, take care to dust them thoroughly and use a gentle non-abrasive cleaner specifically for silver, following the product directions carefully. If you have any concern that inexperienced cleaning will reduce the value of your item, take it to a professional for treatment. Bronze is a different story. Unless it has been lacquered, bronze develops a dark or greenish brown patina over time. This finish is highly desirable and should not be removed. This doesn’t mean you can simply ignore your bronze piece, though. Exposure to chloride can cause a corrosive tarnish that will pit the metal, and chemical reactions with different materials (including the acids from your skin when you handle bronze) can result in an uneven patina. Keep your bronze in as dry an environment as possible and wear clean cotton gloves when handling it. To preserve your bronze, you should dust it regularly (but gently) with a soft brush or lint-free cloth. If the piece is in a state where you are tempted to try a more thorough cleaning, you should probably take it to a professional to see what, if any, further steps are warranted. Altering the original patina of a piece can drastically reduce its value, so it’s best not to take chances. Knowing how to care for your antique silver and bronze pieces will help to bring you years of enjoyment from your treasures. At AuctionKing.com, we gather notable authenticated finds from all over the world to bring to our clients. From fine art and collectibles to high-end jewelry, we bring you quality and value in the convenience and comfort of your own home. Register for a free online account today to start bidding and start winning. Previous PostPrevious Who Is Norman Rockwell and Why Are His Paintings So Famous? Next PostNext Is There a Best Time to Buy a Rolex?